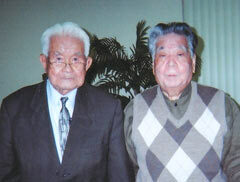 Eijiro Gibo (right) and Seiyu Agarie were reunited in Las Vegas after 68 years. Seventy-nine-year-old Eijiro Gibo, a recognized authority on Okinawan traditional arts and former head of the Okinawa Prefectural Museum, and 94-year-old Seiyu (subsequently: Frank) Agarie have met for the first time in 68 years. Gibo played a part in organizing the meeting between Agarie and his brother in 1945 when they fought on opposite sides during the Battle of Okinawa. Gibo and Agarie were reunited in Las Vegas, and two months later Gibo wrote a letter to Agarie about Okinawa 68 years ago and soon after the war. Put at ease hearing the Nago dialect, Gibo used his connections to find Agarie’s brother Yasuharu in the hills of the Nago area. Gibo told Agarie that Okinawa still faces the same problems as 68 years ago. In recognition of Gibo’s achievements in areas such as folk art and critical writing, the Japan Folk Song Association gave him an award in 2006. He has written books about eisa and kumiodori, and has served as the head of the Okinawa Prefectural Council for Cultural Affairs and as a professor at Okinawa University. Christian minister Toshio Maehara and Okinawan civilian ambassador in Los Angeles Tamiko Uehara managed to link up Gibo and Agarie again.